It is tricky to decide where to stay in Paris. Do you choose style over function, history over style or location instead of anything else. 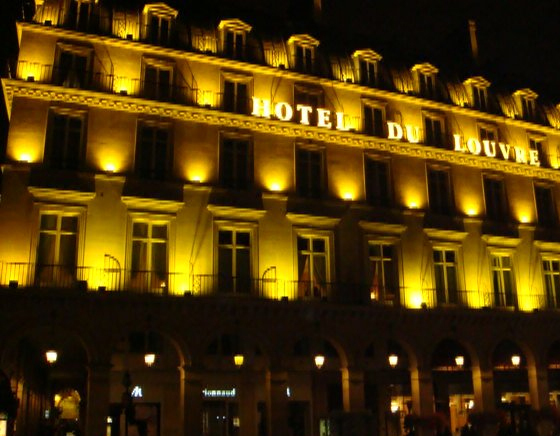 Hotel Du Louvre is an institution in Paris, as the name suggests it is situated at the gates of the Louvre and its terraces overlook the Opera Garnier and the Place to Pailais Royal in the distance. So, while you have history and location on your side, do you also have style? Offering traditional Parisian style and seeped it history, Hotel Du Louvre is famed for both its location and original Napoleon III style. Modern comfort meets traditional French decor, the 177 bedrooms and suites the perfect place to get a taste of French architecture and design. This means that it is all a little on the chintzy side, there are antiques everywhere, thick red velvet curtains, gold piping and all the sweeping stairs, red carpets and ornate vases you would expect. While in somewhere so historically beautiful as Paris, this is often why this hotel is so popular, it has an old-worldly appeal. If you want modernity, this is not the place for you. In contrast to the more modern hotels in Paris, the dark wood in the rooms as well as jewel colour schemes and rich fabrics, marble bathrooms, complete with Annick Goutal toiletries, are an authentic and glamorous Paris of old. If you really want to splash the cash, The Pissarro Suite is really something special. Pissarro painted his impressionist views of Paris on the six floor-to-ceiling windows and the colours in the room are inspired by his paintings with soft grey walls, warm tones of amber and lush taffeta drapes. Not one but two bathrooms (one with a Jacuzzi) mean you can relax while enjoying a private view of Pissaro’s Paris.